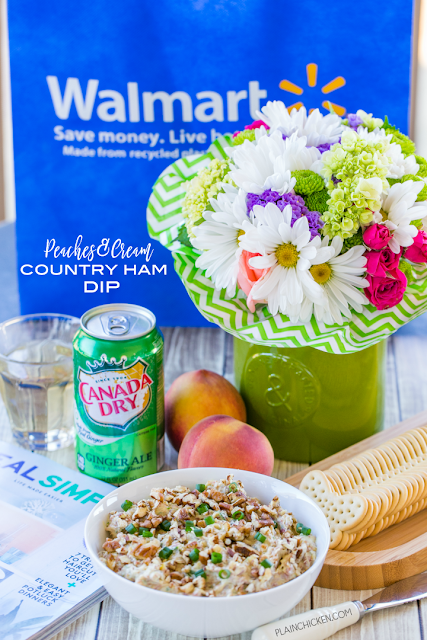 Peaches and Cream Country Ham Dip - so easy to make and it tastes great! Only 6 ingredients! 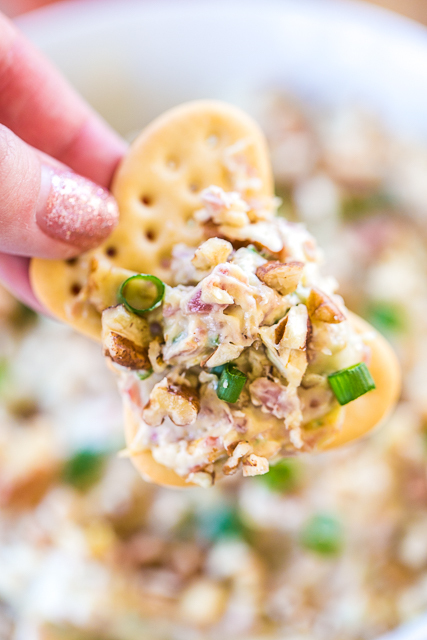 Cream cheese, country ham, dijon mustard, green onions, peach preserves, pecans. Dump everything in the food processor and pulse. Serve with crackers and/or celery. It is always a hit at parties!! Quick, easy, delicious dip recipe. Spring is finally here! I am LOVING the weather. Well, everything except the pollen. YUCK! This time of year, I love to take my afternoon breaks outside on the screened in deck. It is so relaxing to sit outside and have a Canada Dry® Ginger Ale and little snack. I am a big fan of Canada Dry Ginger Ale. I just love the crisp, real ginger taste and refreshing bubbles. It is hard to beat having a cold Canada Dry Ginger Ale and reading a book, magazine or just listening to the birds on the deck in the afternoon. I cherish the "me time" in the afternoons. 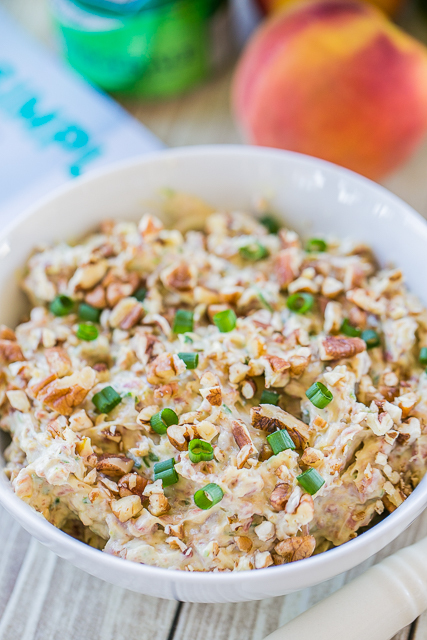 This past week, I've been snacking on this Peaches and Cream Country Ham Dip. OMG! It is SO good!!! It is super easy to make; just dump everything in the food processor and you are ready to eat. Cream cheese, peach preserves, green onions, country ham and dijon mustard. I just love the saltiness from the country ham. I found the country ham with all of the other diced ham at Walmart. It was in the center refrigerated section at my Walmart. If you don't like country ham, you could substitute regular cooked ham. This would even been good with some leftover Easter ham. I served the Peaches and Cream Country Ham Dip with some crackers, but it would also be good with some celery. We are going to a party this weekend, and I have to bring an appetizer. I am totally bringing this dip. I'm sure it will be a hit!!! Right now you can get rewarded with your purchase of Canada Dry Ginger Ale! Just look for the Relaxing Rewards packaging and follow the steps to see how much reward cash you won. The promotion runs from 3/1/17 to 5/10/17. So, run to Walmart, grab some Canada Dry Ginger Ale and start enjoying a little "me time"!! In the bowl of a food processor, add cream cheese, cooked ham, peach preserves, green onions and dijon mustard. Pulse 5 or 6 times, until almost creamy. Transfer mixture to serving bowl and top with pecans. Serve with crackers and celery. I like to relax by putting my feet up. I like to relax by going on a nature walk. I like to relax with a good book on my deck in the summer. Reading a good mystery novel, sipping a mug of hot chocolate, in the peaceful space of my bedroom or the backyard deck. I like to relax with a good book or some music. I like to relax by curling up with a good book and warm drink! I relax by reading a good book on my deck. I like to relax in the hot tub with my wife or curled up in bed watching a movie! I shared on Twitter: https://twitter.com/FireRunner2379/status/843136675073196032. I love to snuggle with my fave blanket and watch my fave movie. I like to kick back in my recliner and watch movies. I love to sit outside, in a quiet space and read. I like to relax by laying on the couch and watching my favorite tv show. I like to relax by sitting in a friend's hot tub. I like to sleep in on weekends. I relax by reading or listening to an audio book. I also like hiking in nature if there is time! I like to relax by curling up in my favorite chair reading a book, and drinking a hot cup of coffee. I like to take long walks in the woods and at the park. I enjoy curling up on the couch with a good book! I curl up with a good book to relax. I like to sit back on our couch and read a good book. Thanks so much. I love gardening, it helps me relax! I like to relax with a cold drink and the Sunday crossword puzzle. I like to watch tv or read a book. I like to relax with a nice warm bath and a good book. After the grandkids go home I like to collapse and read a good book or binge on Netflix. I love it when I can get an hour to myself to relax in a hot bath with chilled water and chocolate! I feel so much more relaxed and less stressed! Hanging out on a sunny deck with a beer in Breckenridge, CO. I like to relax by going for a swim! A nice hot relaxing bath at the end of the day! I like to relax sitting on the couch, reading the Word and drinking hot tea. I like to relax by reading a book while listening to the radio. I like sitting down in a cozy chair with a good book.